New Delhi, February 18: Rain in Delhi made a comeback on Monday as heavy rain lashed the national capital that too with a bang. 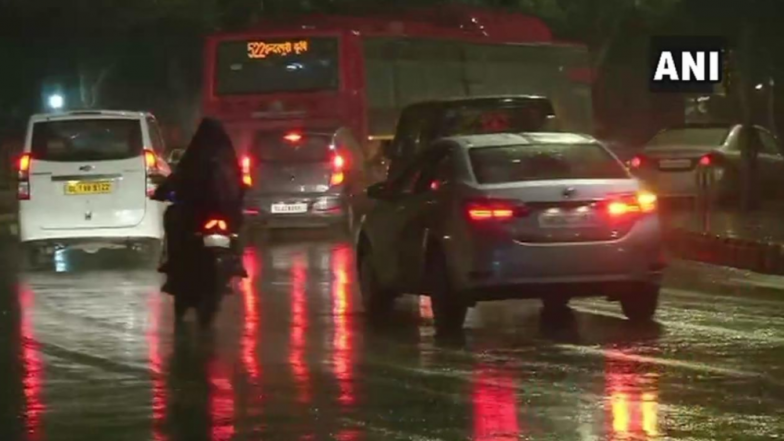 Parts of Delhi- National Capital Region (NCR) witnessed light showers Today evening, resulting in a dip in temperature and making the temperature a bit colder. The rain comes after the Meteorological Department predicted the possibility of rain in the afternoon. Rain Lash National Capital, More Showers Likely in Next Few Days. "Clouds will partly cover the sky throughout with the development of thunder lightning in the later part of the day," an India Meteorological Department (IMD) official said. It is expected that the air quality will improve following the rain. The national capital recorded minimum temperature at 11.2-degree Celsius, which is normal for this time of year. The MeT has predicted shallow fog on Tuesday morning with Thunderstorm and light rainfall. It further added that the minimum and maximum temperature is likely to settle at 24-degree Celsius and 13-degree Celsius. Apart from the capital city, Uttarakhand, Himachal Pradesh and Jammu and Kashmir are expected to receive rainfall in the coming days.